Businesses across Cornwall will ‘Stop for Tea at Three’ next week to spread the word about their support for the Cornwall 100 Club, the corporate arm of the Cornwall Community Foundation (CCF). The 80 members of the Cornwall 100 Club (C100) will be treating their staff complete with Cornish tea and biscuits, courtesy of three of Cornwall’s oldest businesses. Tregothnan has donated the tea and Proper Cornish has supplied a selection of Furniss Biscuits. 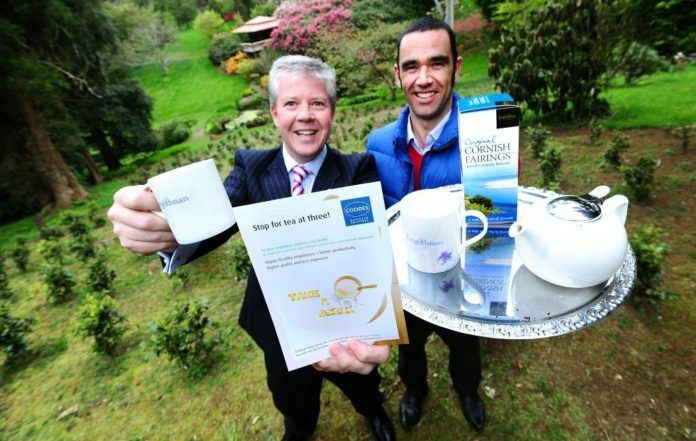 Coodes Solicitors is organising delivery of the ‘Stop for Tea at Three’ boxes to all the members, which will include their advice on how to keep employees happy. Charles Reynolds, chair of C100, said: “Stop for Tea at Three is a great opportunity for our members to engage with their staff, clients and suppliers and tell them about the work that C100 and CCF are doing. Thanks to Tregothnan, Coodes and Furniss!